Global Change Scenarios of the 21st Century informs readers of conceivable environmental changes in the next hundred years. Integrated scenarios are used to communicate large amounts of information about different aspects of the global environmental system, together with society's role within this system. 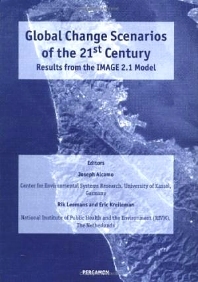 Uniquely, the scenarios are generated by an integrated computer model, IMAGE 2.1, which enhances consistency and provides a framework for linking environmental and social aspects of global change. The book is divided into four parts, the volume begins by describing the model used to generate these scenarios, explaining its current features. This is followed by scenarios of changing climate, energy and food use, land cover, acidification, sea level and many other indicators of global change up to 2100. The long term consequences of actions to reduce greenhouse gas emissions are then explored in a section which uses the concepts of 'safe landing' and 'safe emission corridors' to address the connection between the long-term climate protection and short-term emission reductions. The final sections examines how the complicated and crucial issue of how complex global scenario information can be communicated to policy makers. For scientists, policymakers and stakeholders of climate policy. Foreword. Acknowledgements. Preface. An Instrument for Building Global Change Scenarios. Global modelling of environmental change: an overview of IMAGE 2.1 (J. Alcamo et al.). Baseline Global Changes in the 21st Century. Baseline scenarios of global environmental change (J. Alcamo et al.). Integrated scenarios of acidification and climate change in Asia and Europe (M. Posch et al.). Evaluation of Global Policy Scenarios. Emission scenarios and global climate protection (J. Alcamo, E. Kreileman). The safe landing approach: risks and trade-offs in climate change (R. Swart et al.). Evaluating cost-effective strategies for meeting regional CO2 targets (J. Bollen et al.). The land cover and carbon cycle consequences of large-scale utilization of biomass as an energy source (R. Leemans et al.). Epilogue: Global Models and Global Policy Making. Global models meet global policy: how can global and regional modellers connect with environmental policy makers? (J. Alcamo et al.). The delft process: experiences with a dialogue between policy makers and global modellers (E. van Daalen et al.). Author index. Subject index.